Free Shipping Included! 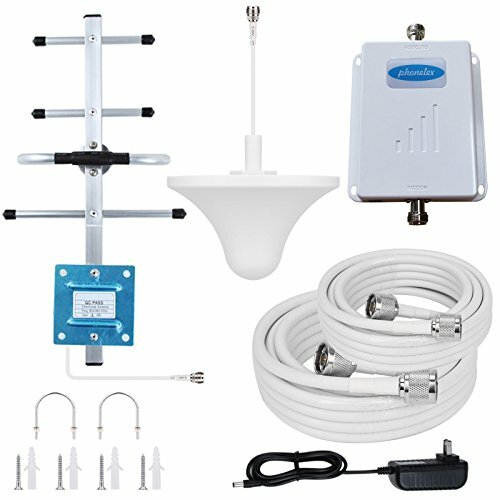 Phonelex Cell Phone Signal Booster AT&T T-Mobile 4G LTE Band12/17 700Mhz 70dB Cell Phone Signal Amplifier Mobile Signal Booster Repeater with Indoor Ceiling / Outdoor YaGi Directional Antenna For Home by phonelex at Got Busted Mobile. Hurry! Limited time offer. Offer valid only while supplies last. NOTE : Before you use this item , You should get 2-3 bars of stable signal in the location where the outdoor antenna is fixed in. View More In Signal Boosters - Page 2. Before you use this item , You should get 2-3 bars of stable signal in the location where the outdoor antenna is fixed in. 5. Connect the Base Unit to the provided power supply and plug into a power outlet. This cell phone signal booster is designed for 4G LTE Band12 Band17 AT&T 700mhz cellular band , Much faster high-speed 4G LTE internet. Perfect for people needing fast uploads and downloads for streaming apps such as Google Chrome, Safari, YouTube, Netflix, Pandora, Spotify, and other data-heavy apps. Supports voice and 4G data for 4G/LTE AT&T mobile phones, including IOS , Android, Windows Phone Systems, etc. , better cell phone voice quality, faster uploads and downloads Data,Get fewer Missed calls, solve your bad mobile network signal and enjoy your Nice time.